This stunning 3 Tier White Wedding Cake, was one we made sometime ago, but since i built our new website, being as smart as i am…. forgot to back up site so lost some of our original posts, big lesson learnt. The cake was made for a lovely young couple, who really did make our job very easy, by that i mean they new exactly how they wanted their Wedding Cake to look, right down to the height of the cake. Our clients had taken advantage of our free consultation and tasting which you can book here, and sampled four flavours whilst we discussed their cake design. It was decided that the entire cake would be made from Dark Chocolate Mud, from our Classic Flavour Range. 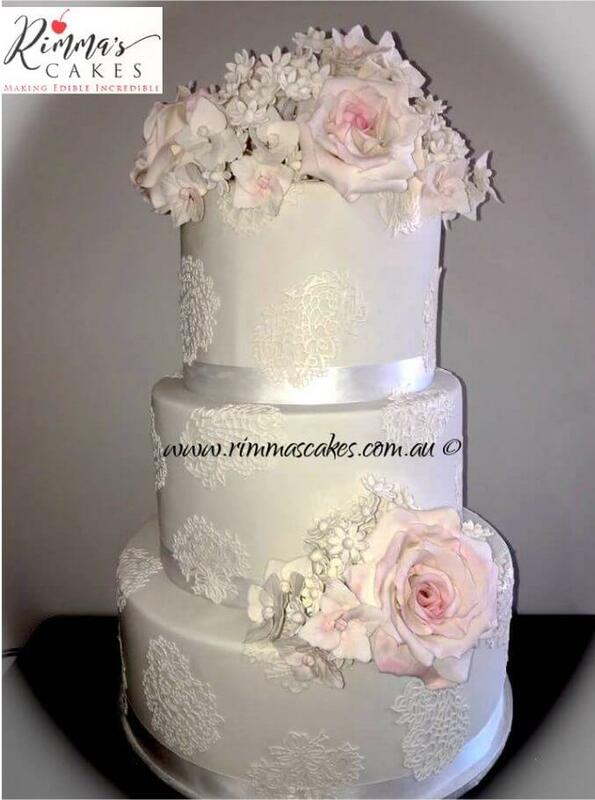 The flowers as normal were made two weeks before the wedding date to allow drying time in readiness for air brushing, in the beautiful soft pink, these larger soft pink flowers were then surrounded by plain white smaller filler flowers to give a very bulky but elegant look and feel to the top of the cake.